You are here: Home > Android 4.4.2 KitKat update on its way for the T-Mobile Xperia Z1s? Android 4.4.2 KitKat update on its way for the T-Mobile Xperia Z1s? Being on T-Mobile can often mean software updates coming a little later than they do elsewhere in the world, or sometimes on other U.S. carriers. Having been released late last year, the Xperia Z1s is yet to be updated to Android 4.4.2. But that could be about to change. 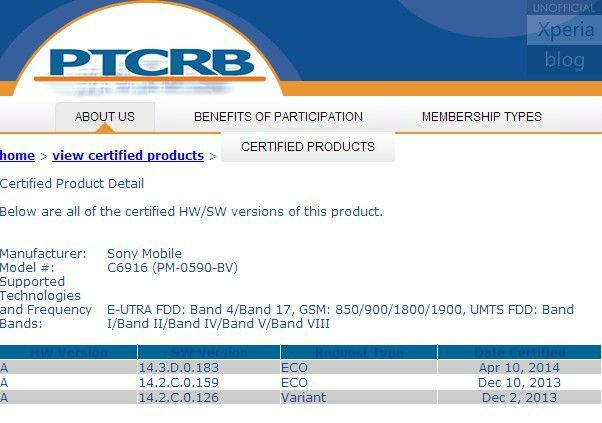 XperiaBlog reports on some findings online at PTCRB showing certified software versions. Firmware build 14.3.D.0.183 was certified last month and could be set to roll out later this month for Z1s users on the Magenta carrier. This follows on from two previous builds, 14.2.C.0.126 and 14.2.C.0.159, both of which were certified at the end of 2013. Of course, there’s no official word on its availability just yet, but we’ll be sure to let you know when/if it arrives. How are you Z1s users feeling about your devices? Are you happy with them? Do you wish you’d gone with a Samsung/HTC instead? I’ve recently picked up a Z2 myself and have been pleasantly surprised by it. For me personally I would still enjoy it. Samsung is the worst in my opinion I had the note 2 for a year and nothing happen no update what so ever but from what I read a month or so ago seeing the note 2 being update to 4.3 unofficially. So I basically scrap the note 2 for a nexus 5 best thing I ever done. But second had to be lg I had the g2x the phone was a nightmare random reboot/shutdown no update. Love my Z1s. Of course I would love it even more if kit Kat was available for it. Hello what about those who purchased the Sony Xperia Z??? International version is at 4.4.2? While T-Mobile version stuck at 4.2.2! A friend of mine has this smartphone and keeps asking me when will a update be available? Yes, 4.4.2 out of the box. My Z1 from the UK also received the update. This is T-Mobile slacking for sure. HTC, Samsung, or LG can drop an update and in short time it is certified by T-Mobile and pushed out. Saw this happen with updates to 4.3 and 4.4. Sony has released 4.3 for the Z almost 5 months ago. They do not have anywhere near the type of customized overlays that the other OEMs use on Android. I’m not sure why it is taking so long. Some say it’s the baseband that they have to get working but really, 5 months? These are premium phones and deserve the same attention to releasing updates like the other 3 companies. It’s like they took the product and milked it for customers and don’t give a hoot about updates since sales volume isn’t large. Not exactly the way to retain customers who like a model line and it does hurt Sony. Last week I was with a friend as he was signing up for service and was eying the Z1 hard as my upgrade from the Z. I’m at my Jump! upgrade point but hate how they are treating Sony phones. It has me thinking twice. That was a double sale the store and rep could have made. There’s always the option of flashing the firmware for European version while keeping the T-Mobile baseband for the original, isn’t there? I did the opposite with my international Z1; kept the 4.4.2 firmware but flashed the baseband from the Z1s. It worked like a charm! It’s relevant to this subject and I am not alone in the inquire about the Sony Xperia Z. Next time read before responding so you will not embarrass yourself. It’s a valid question and much more relevant here than on the other recent articles. the Z1s is not over a year old! The Z is though. well, this makes the phone more interesting now. Even with the unlockable bootloader, I may still check this one out as a second phone. Mixed emotions I want kit kat 4.4 but don’t want the SD change. My Z1S works great but the update would be nice and when I am swimming down the creek with it I can snap some great pics. YES fully Waterproof!!!! Yea, I was in the pool on vacation just the other day and my wifes z not the z1s did just fine in the water. Only problem is no dedicated camera buttong. The Z1 has a dedicated camera button, the Z did not. The Update Center just updated itself for me yesterday. Hopefully that’s a good sign. I really want to play around with the google camera on the ZIS. If I don’t see 4.4.3 by August i am likely jumping to an iphone 6 or HTC One M8. me too, its so frustrating. I chatted with t mobile yesterday. the engineering department has the update supposedly. they checking for bugs and other issues. that is what they told me so who knows maybe we get it soon. Pretty happy with my Z1s. Waterproof and 20.7 megapixels is what sold me on it, over Samsung, Htc and LG. All I need is a kit kat update. What about the z? I already got rid of my z because of that. My wife doesn’t care about updates so she still has hers but I am reluctant to upgrade her to the z1s since it has no new updates. My Z1 (international unlocked) received 4.4.2. ETA: Since you edited your comment, I will do mine as well. The Z is slated to get 4.4.2 this month, internationally. I do not know about T-Mobile’s release date. I’m definitely Jumping to iPhone 6 in August. The Z1s is my first Android and I am so very displeased with the update availability and neglect. Thinking twice about T-Mobile as well after switching from AT&T. The neglect is T-Mobile. Sony updates their products but the carrier needs to approve it before releasing it to their customers. Give a different Android device a chance unless you have had an IPhone before. I have always had an iPhone. Last month my wife convinced me to try android and so I got the Z1s. unfortunately Tmobile locked the Z1s down tighter than a….on a different regard you just cant beat the customization of android vs. iOS. I tried iOS for a little bit an quickly changed back to android, have not picked up my 5s in months, way more options on android and not “dumbed down” like iOS. My enjoy my international Z1 way more than boring iOS but that’s what opinions are for. I had a HTC one and switched to a z1s right after my one got the KitKat update. I switched because the Z was waterproof. I love my Z I just wished it got better update support. How about the KitKat update for the Z (C6606)????? May or June according to Sony. Freaking Note 2 update is taking forever…..ridiculous. I think what so many forget is the Xperia Z1s had features built in that the other xperia phones got in the Update. I love my Z1s and my wife has the GS5 and she still has times that she picks up my phone and smiles because of its build. Its an amazing phone and the only thing I’m looking forward to in the new update is a few tweaks to the WiFi and Bluetooth issues that come about from time to time. Anyone here have the newer Z1 LTE (unlocked international version)? Model C6906. I’m thinking of selling my LG Optimus G Pro for one of these in white! Sorry, no trading or selling on the blog please. Thank you. I’m not trying to sell on here :) it was just a comment. That’s what Swappa is for! Any one have the inside of the screen on the Z1s just crack on them? Mine was in my hand when all of a sudden the screen stopped responding then started to notice about five cracks go across the screen starting at the edge by the power button then going across the screen. T-Mobile next day shipped me a new phone for only for bucks but I’m worried the new phone will do the same. I am one to drop my phone fairly frequently. So far so good. But I do have a case on it. I’m with you. Jumping ship to iPhone 6 once it hits the market. Haven’t had a good experience with droid at all. Laughing so hard right now… I’m leaving this phone if I don’t get an update… Hahahaha… The Wahmbulance is on its way for you. The Z1s is an amazing phone. It does any and everything I want/need it to do. An update will be nice. But start saying I’ll switch carriers before phones, this is TMOBILES fault… I will never touch any other carrier but they are always slow with updates. I’ve had HTC, Samsung and IPhone and all fall behind on updates, thx to TMOBILE. So get a clue, grip or whatever but don’t think Xperia is not as good, since this is a great phone. And IMHO the BEST phone.. Screen amazing, power amazing, battery life amazing better then my Gs4 was by 4 hours, connected fast, plays any game I want and looks great when played through my projector.. You want a great phone then this is it. You want less than great then switch…. Good day…. I said good day!!!! I have really enjoyed the hardware on the Z1s. Coming from a BlackBerry Z10, I have been disappointed by Android as an operating system however. I have been really looking forward to the KitKat update to see if some of my Android quibbles are resolved or maybe just look prettier so I don’t mind so much. In any case, an amazing phone by Sony and has done everything I’ve asked it to do. Love the battery life, the screen, and the waterproofing, just still not totally sold on Android. Sony gave kitkat and tmobile approved since April 2014 and now its tmobile is the one who is holding up the release of kitkat to the z1s. why is tmobile waiting for the launch. Still waiting for the 4.4.3 update for the z1s. I did get the 4.4.3 update on my tablet Z this month. Come on t-mobile! isn’t on all t mobile phones or only the z1s? because I’m planning on getting the z1s this weekend? Still not on the z1s but Sony just released another sw build for the z1s on T-Mobile. Should be available soon. I’m not sure about other T-mobile phones and 4.4.3. I’ve had my z1s for ~4 months and it works great. None of the problems reported above on my phone. Great display, Bluetooth to a portable speaker, wi-fi. I use google for contacts and photos, no problems. Wish I would have gotten a z2 or something not this device nothing works right on it. whats wrong with the z1s?